Custom Covers, the leading marquee manufacturer in the UK specialising in the manufacture of PVC covers, frame marquees and decorative marquee linings exhibit this year at the Showman's Show for the 30th consecutive show. 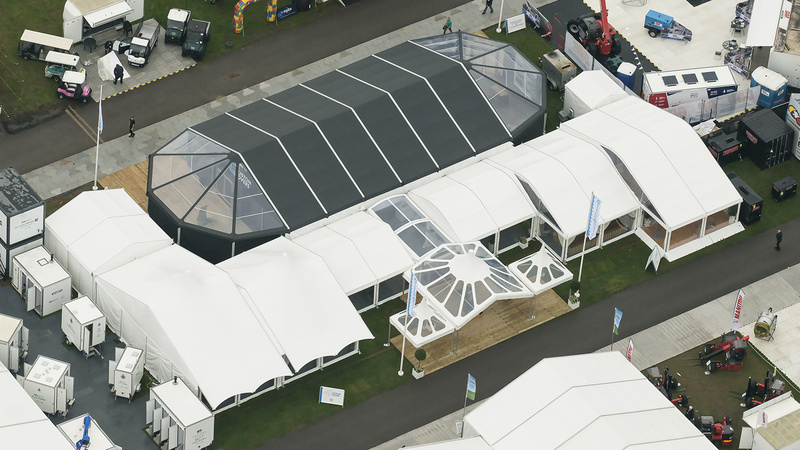 The Custom Covers Stand will comprise 630 square metres of dressed space, principally made up of their three most popular Coverspan structures, namely the 6m, 9m, and 12m, 3m bay marquees on a standard 2.3m leg. These structures will be linked together with their signature Clear PVC "Bake-off" cone roofs with four Romsey pagoda entrances. New products showcased for the first time this year will include: insulated linings – a new product which combines both sound reduction and heat insulation for marquees; CQ stretch “Monty” lining roofs with a clean and taut linings finish and newly designed hard walling, improved in quality, security and price. In addition, in April of this year Custom Covers expanded its hire department to offer marquee frame and PVC cover hire, in addition to its established marquee linings hire service, elements of this year’s stand showcase this new expansion. Custom Covers will also be showcasing its sub-frame flooring system with “flip flop” floor extrusion; a full range of Coverspan Plus framework, in both curve and standard frames; ivory starlight linings, black starlight linings and ivory starlight walls; clear PVC “Bake-off” cone roofs on each of the standard structures; a full range of decorative linings and a PVC Print area showing more ideas of what’s possible.